The first photos from Harriet the upcoming biopic on legendary abolitionist Harriet Tubman, have been revealed. Focus Features initially announced the project last fall, with production getting underway in September. 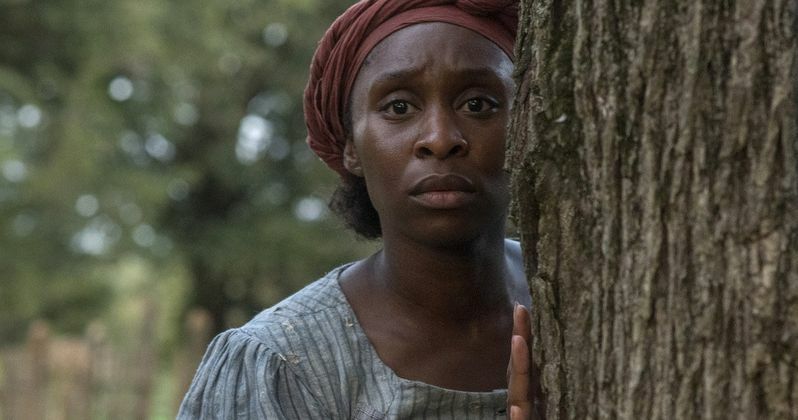 The photos offer our first look at Widows star Cynthia Erivo as Tubman. Amazingly, Harriet Tubman, who was born into slavery, managed to free herself and went on to free an estimated 70 enslaved people, is one of the truly iconic figures in American history. Yet, somehow, her story hasn't been told on the big screen. Until now. Cynthia Erivo had this to say about Harriet in an interview with People released along with the new photos. "I don't think she set out to be a superhero. I think she just set out to do the right thing... I knew she was small like me. I knew she was 5 foot, or 4'11. It fascinated me because I realize this woman was extraordinary because she was small and like me in every sense of the word." Cynthia Erivo is a Tony-winning actress who has done a lot of work on Broadway but has been making her way into Hollywood. She starred in Steve McQueen's acclaimed Widows last year, as well as Drew Goddard's Bad Times at the El Royale. This year, she's set to star in the YA adaptation Chaos Walking, but Harriet is sure to draw a lot of attention, given that she's going to be portraying such an iconic figure. Erivo also expressed a great sense of pride in being involved with the project and said that this has been a long time coming. "It's a new way of looking at Harriet. She was a hero, and now we get to really tell her story because we haven't really heard her story. It's been long overdue." Harriet comes from director Kasi Lemmons (Eve's Bayou, Talk to Me). Lemmons is working from a script she co-wrote with Gregory Allen Howard, who previously penned Ali and Remember the Titans. The biopic follows Tubman on her escape from slavery and subsequent missions to free dozens of slaves through the Underground Railroad in the face of growing pre-Civil War adversity. The cast also includes Leslie Odom Jr. (Murder on the Orient Express), Janelle Monae (Hidden Figures), Joe Alwyn (Mary Queen of Scots), Clarke Peters (Three Billboards Outside Ebbing, Missouri) and country music star Jennifer Nettles. Producers on the project include Debra Martin Chase, Daniela Taplin Lundberg and Gregory Allen Howard. The studio has yet to set a release date, but the movie is expected to hit theaters in 2019. It's early to say, but this certainly seems like it could have Oscar potential, so don't be surprised if it winds up with a very awards season-friendly date this fall/winter. Be sure to check out the brand new photos from Harriet below, which comes to us from Focus Features.